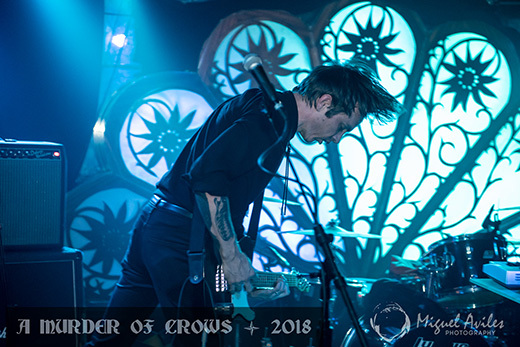 Recurring NYC summer music festival, A Murder of Crows – focused on Post-punk, New Wave and Death Rock – was held at Brooklyn Bazaar on the mid-month weekend of Sept 15 and 16, under the auspices of TempleChurch Entertainment. Festival-goers had access to sets by five different bands in the upstairs performance space on each separate night. On the ground level were merchants and curators manning booths to constitute The Dark Market where wickedly themed, crafted curiosities and more were on sale and where advocacy groups gave voice to their causes. On the basement level, a nightclub disco dance party was also part of the festival. Famous deejays serving up tracks at this lower level dance party the first night included DJs Dave Bats, Martin Oldgoth, Patrick and the event’s impresario, Sean Templar himself. Lovely hospitality hostess Mandana Banshie greeted arrivals and oriented them to the various points of interest at the festival, offering one-day ($30) or two-day ($50) access according to their preferences. One of the themes was bidding farewell to the famous Goth party, Release the Bats in one of three end-of-an-era parties to conclude its run in LA on Oct 26. 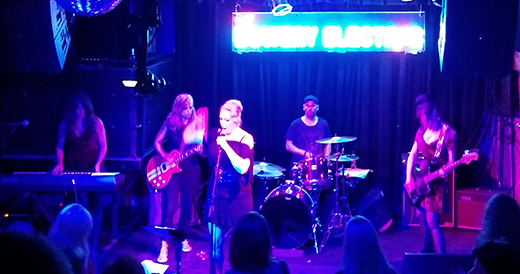 After satisfying our curiosity at the Dark Market and making a small purchase, New Dark Age settled in to hear the live band performances that took place on Saturday. First up, Floridians Atari Nite opened with a pleasantly bombastic rock set. Next, Cemetery proved to be anything but dead, with an even more bombastic, even frenetic, driven, almost chaotic set, the vocalist jumping offstage into the crowd to supercharge up their energy. Next, Dave Bats introduced Minnesotans, Rope who played an eminently danceable and melodious set. They were followed by The Last Cry whose emotionally wrenching, melodious hard rock was spear-headed by a highly dramatic, full-throated lead vocalist. Finally, headliners Ritual Howls opened with their hit, “Helm”, its incongruously Western style guitar strumming punctuating its pitch-black chanted chorus. Ultra deep bass, twangy guitars, and deep drones amplified the deliciously morose mood of “Nervous Hands,” “Final Service” and other such other favorites as “Scatter the Scars” which they played late into the morning. 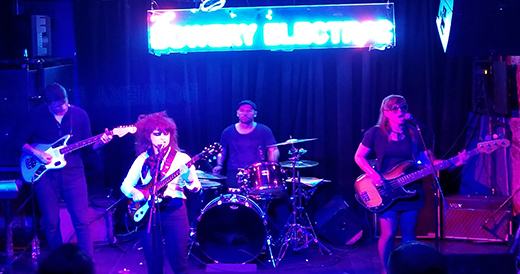 The second date, Sunday Sept 16, saw Rhode Island’s post punk band Way Out open; followed by popular Brooklyn bands the Bootblacks and Azar Swan; then displaced Australians – now out of LA – the VOWWS, before headlining dark wavers, Actors from Vancouver concluded the show. The deejay party downstairs, termed Forever Young, was different the second day, featuring such top spinners as DJs V Christ, Angel, Jet and Ash. DJ Frankie Teardrop manned the mixer in the Dark Market on closing night. The Bowery Electric is a bi-level nightspot with a nice bar upstairs and a cozy performance space downstairs featuring a raised stage and split level viewing and/or dancing. The usual bill includes live rock bands, punk, reggae and the like as well as deejay dance parties. This first September Friday night provided an exceptional experience for fans of New Wave and Gothrock. Headlining the bill was the by-now famous Joy Division tribute band, Disorder stopping back at home base as part of a brief East Coast tour which recently included an August gig in Baltimore and a subsequent stop in Richmond Virginia to take place in mid-September. Superstar DJ Sean Templar manned the booth and spun iconic favorites of the genre with the likes of Bauhaus, Sisters of Mercy and Peter Murphy. Next up, All Cats Are Grey, an all girl band (but for the aforementioned male drummer who stayed on from the first band) covered The Cure’s beloved opus, including “In Between Days,” “Just Like Heaven” and rendered a consummate performance of “A Forest.” Lead singer Mary Choselle Colbert relied upon her own singing voice and stage persona rather than attempt to effect a gender-contradicting imitation of Robert Smith. At around 10 p.m. acclaimed tribute band Disorder opened their act with a montage of interview clips relating to the burst of enthusiasm over the early discovery of Joy Division before launching into the ominous “No Love Lost.” Then on to “Disorder” from which the band takes its name. By the time Disorder had reached the tenth song, “Love Will Tear Us Apart” and the eleventh, “Transmission,” the exhilarated crowd of young and not-so-young spectators, was not letting them off stage. A ferocious demand went out from the audience shouting for an unplanned encore, so Disorder pulled a tour de force with the emotionally apt “Ceremony” before being allowed to end their performance. 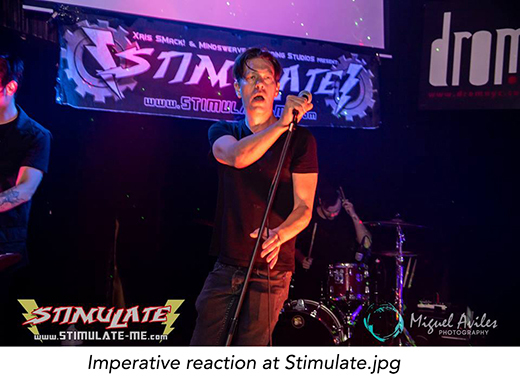 Stimulate, the notoriously edgy, recurring music party celebrated its 10th anniversary in September by bringing back the very first band that performed at their opening event in 2008, Imperative Reaction. Host and impresario Xris SMack welcomed the return of these L.A.-based electro-industrial veterans along with Brooklyn trio, NØIR who opened the live show. The anniversary was combined with a Gary Numan after-party following the New Waver’s sell-out performance at Irving Plaza. 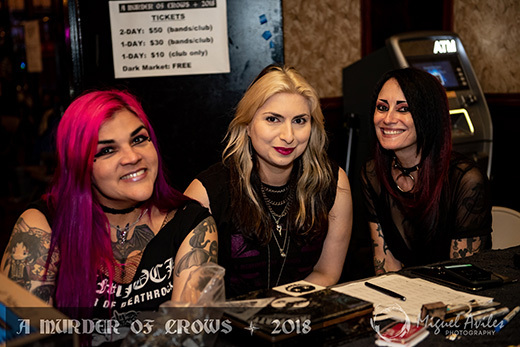 As always there was a stellar lineup of deejays including Annabelle Evil, DJ Paradox, Jet of Vampire Freaks fame and the host, Xris himself who treated attendees to every kind of gothic/industrial dance-conducive music. Again – as always – there were sexily-clad dancers on stage overlooking the highly stimulated crowd on the dance floor below. The trio of Metropolis recording artists NØIR came on around midnight – masked, as is their signature stage appearance. 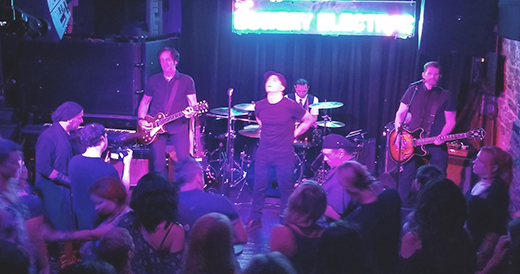 They performed several of their by now increasingly popular and familiar songs plus a special throw-back to frontman Athan Maroulis’s early career with a piece from his earlier association with the industrial band Spahn Ranch. World-famous electro-industrialists Imperative Reaction were welcomed with enthusiasm and reintroduced to the crowd around 1:30 a.m. and performed a set including their hits as well as new tracks, in their characteristic style employing two vocalists, one of whom served at the keyboard as well, while both were backed by live drums and electronic percussion. A trample-enthusiast, wrapped in a carpet, lay adjacent to the bar, making his encased anatomy available to assist bar patrons to step up as they approached to get their drinks. NYC goth scene celebrity Aurelio Voltaire accompanied by his lovely lady, was present as were Sean and Mandana Banshie Templar and delight-to-the-eyes, statuesque, red latex-clad beauty, Ashley Bad, who participated along with Xris, in presentation of the anniversary cake topped with a pyrotechnic sparkler. It’s hard to imagine a more fun and festive night than this, that continued well into the morning. 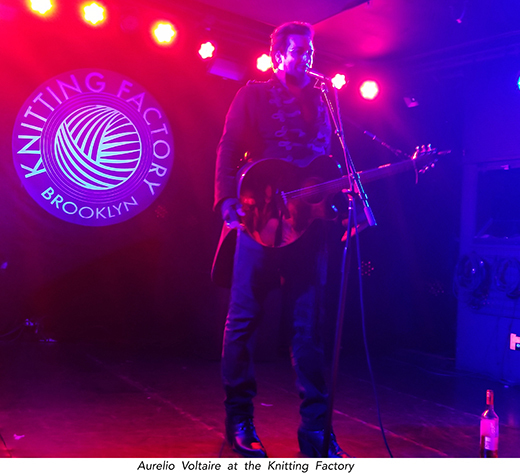 The entertainment production company Vampire Freaks, along with three outstanding musical performers hosted a night of shows at the Knitting Factory in Brooklyn on the evening of Sept 28, headlined by the world-famous Aurelio Voltaire. The Knitting Factory is a grungy yet cozy venue that resembles the old CBGBs in spirit and mission. Indeed, its original location was in Manhattan’s Lower East Side like that venerable, now-defunct club to which comparison is often made. It’s on the ground level of what used to be the Brooklyn Luna Lounge and has a capacity of about 300. 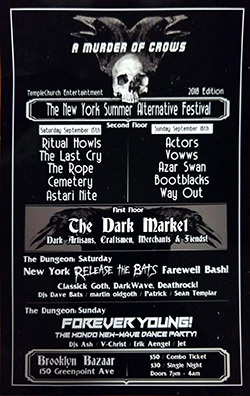 This night, about 150 showed up to see the trio of acts introduced by impresario Jet VF, noted producer of such famed events as NY’s Cybertron and the annual Dark Side of the Con. Jet also curated the deejay set between acts with the likes of London After Midnight, Bowie and The Smiths. Opening the night around 7:15 p.m. was the horror-punk duo The Long Losts, consisting of the married couple, vocalist Anka Jureña and guitarist Patrick McGowan. Their performance was nothing short of dazzling. Tambourine wielding Anka’s noticeable baby-bump, made her even more delightfully shapely than ever, while her beautiful features were under lit – cinema style – in brilliant and garish colors. The themes were – for want of a better word – “spooky.” Drawing from their popular album, “Scary Songs To Play in the Dark, they performed such gems as “Girl With the Haunted House Tattoo” and “Glow in the Dark.” In a twist on a classic scene from “Frankenstein,” a scantily clad dancer rose up from under theatrical wraps when they played ”Fritz Throw the Switch” off their “To Night” collection. A tribute to The Munsters’ Lily Munster was introduced with the famous TV show’s musical jingle. Patrick’s electric guitar and a pre-recorded percussion track kept the set within the traditional hard rock & roll style. 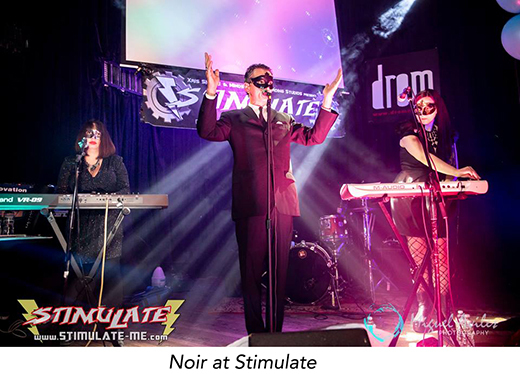 An amazing performance followed, featuring North Carolinian, Crystal Bright, a gorgeous keyboard virtuoso and operatic vocalist who appeared in steampunk attire and performed a set of luscious, creative and amusing pieces accompanied by a drummer. Each gave her opportunity to showcase her amazing voice and stunning skills on both the accordion and a freestanding keyboard. In a twist on the old standard, “You Are My Sunshine,” Crystal Bright led the audience in a sing-along in the darker key of A minor (instead of the usual C major), reflecting her “Southern gothic” style. The combination of her vocal skill, musicianship and stunning stage persona were a rare treat and a source of astonishment to those present. When the headliner, Aurelio Voltaire was introduced by Jet, the crowd roared to welcome him. He is known for interactive, tongue-in-cheek, clever and cutting narratives done along with acoustic guitar-driven Anti-Folk style. He quickly demanded – and received his consistent companion – a bottle of spiced rum from which to swig. Playful pirate themes and social satire ran through the performance. Goths, small town America and the New York scenesters were targets of Voltaire’s sarcastic parody. His show was highly interactive with an audience that appeared to be composed of deeply committed fans that sang or lip-synced along with much of his set. He told many an amusing anecdote and singled out birthday celebrants in the audience for good-natured ribbing. When a funny narrative about his Hispanic ancestry and the Mexican Day of the Dead prompted him to mock a meddling “Social Justice Warrior,” one angry protest was issued from an audience member who stated that she was from the U.K. She tried to instruct Voltaire that the term was used only by what she called “right-wing a—holes.” Voltaire leveled her, first, with a snarky reply, that this is America and that we give instruction on how to speak English. Then he went on to demolish the whole SJW attitude with a hilarious song off his newest album, “So You’re Offended,” mocking those who perpetually take offense. Voltaire’s show had so many and diverse jokes, themes and tales that it is impossible to keep track and report all of them here. Suffice it to say that as always, he left the spectators, laughing, singing along and eager for every musical element and humorous yarn. Newark’s famous nightclub also celebrated an anniversary in September – its 27th! 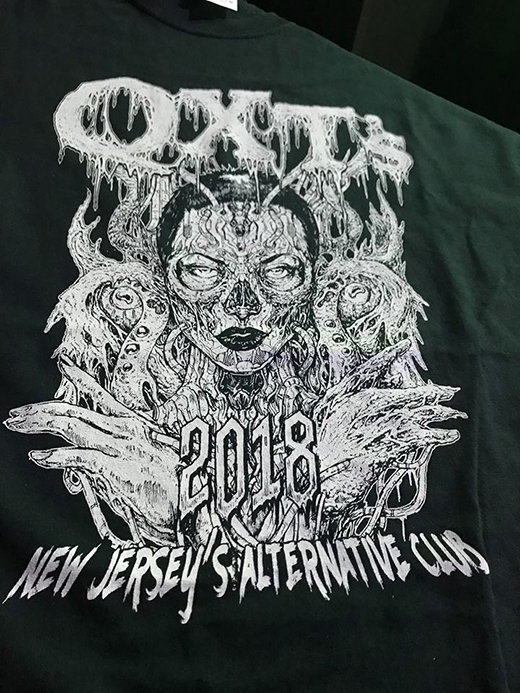 This makes QXT’s not only the foremost dedicated alternative dance establishment, but the longest running in the greater metropolitan region. To honor the occasion, entrance was $15 that night, and the first hundred attendees received a free, newly designed teeshirt. The line-up of deejays ran from A – Z, DJ Ash to DJ Zeitgeist including residents like Damian Plague and Mindsolvent plus frequent guests Helixx and Caelestka, fourteen in all! Videos were curated by TM5. All three bars and dance spaces on both floors were open from an early 9 pm start, and festivities ran until 3 am in the landmark venue located in downtown Newark adjacent to the safe Ironbound section and provided with plenty of secure parking. The first Saturday in October kicked off the Halloween season with a special event, the Gothic Vampire Cruise. Hosted by Faunesk Productions, this represented the third recurrence of this event. Hostess Kai Irina Hahn arranged a unique variety show of entertainment including role-playing, costumed Count and Countess Orlok, belly dancers and a smashing performance by her own band, the electronic rock group The Sedona Effect. 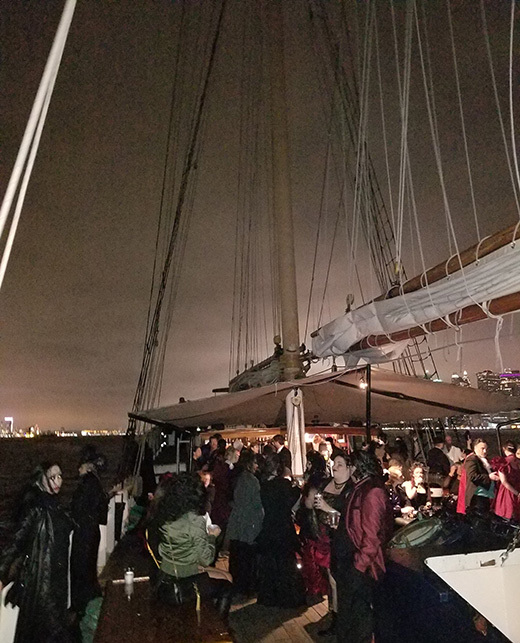 The excited crowd was both Gothic and Victorian in looks and attire as they boarded the fully rigged schooner, the Demeter, via gangway at the Battery Park slip. Happily the weather held off, but the ship’s deck was well equipped with a canopy, just in case. The piéce de résistance was a grand finale featuring Vangeline Theater Company’s Sindy Butz, who performed a riveting and poignant Butoh “dance” of sorts, that both touched and terrified the completely transfixed audience. DJ Patrick kept the appropriate mood between acts with an ethereal, trip-hop blend that included Dead Can Dance and similar moody tracks. A well-stocked bar and hospitable crew made everyone comfortable as the Demeter hoisted sails and cruised the environs around the Stage of Liberty, Ellis Island and the Upper Bay area. The cruise went on from about 9 pm to 11 pm when the ship finally returned to dock. An afterparty for the Gothic Vampire Cruise on the Hudson was held at Necropolis in its customary location, mid-town’s Windfall, where landlubber goths were joined by the recently disembarked vampiric cruise attendees. Upon arrival, they were greeted by Skinny Puppy’s “Smothered Hope” spun by master DJ Erik Aengel. DJ Patrick regained his land-legs and joined the stellar roster of deejays which included Sean Templar and host Father Jeff Ward spinning New Wave, Synth and dark dance into the night. Exhibit curators Joanna Ebenstein and Laetitia Barbier greeted and directed the dozens of Morbid Anatomy devotees who attended the latest exhibition and re-opening of the library’s new home in the enchanting Fort Hamilton Gatehouse of Brooklyn’s Green-Wood Cemetery. An outdoor wine reception was combined with a meet-and-greet, as attendees entered and toured both the first floor exhibition room, and then made it up the charming, antique spiral staircase to the newly re-stocked attic library. Containing over two thousand books, Morbid Anatomy serves as an open-access research library and is also home to photos, artworks, ephemera, and artifacts. Starting out as the Morbid Anatomy blog run by author Joanna Ebenstein (“A Graveside Companion” et al.) 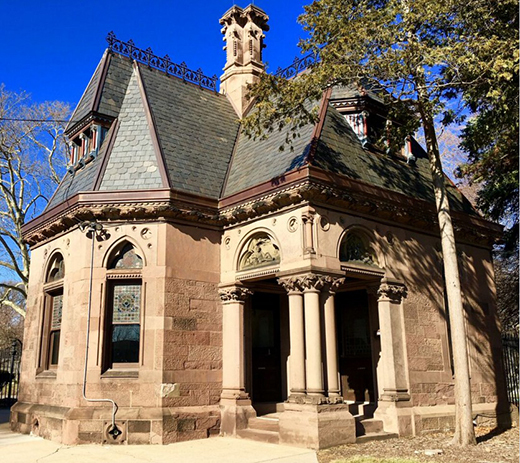 in 2007, the library first found a home in 2008 in Proteus Gowanus, subsequently at the now permanently closed Morbid Anatomy Museum, before settling into the Green-Wood Cemetery’s historic gatehouse. All this while, it has hosted and produced lectures, presentations, exhibits, workshops and publications around NYC as well as organized tours to festivals and museums around the world. The current exhibition and the focus of the event is housed on the first floor of the gatehouse and features art and artifacts that fit into the theme of “Bridging Two World: The Land of the Living and the Land of the Dead.” The centerpiece of the exhibit is housed in a glass cabinet containing statuettes, tiny dioramas, articles and artifacts mostly pertaining to the Mexican Day of the Dead and other folkloric traditions. Representations of shamans, spiritual mediums, rituals relating to ancestor worship, metaphoric and allegorical imagery of the interface between the living and the dead are on display on the walls. Besides their fascinating symbolic significance, these works prove to be of surpassing aesthetic appeal, even when somewhat gruesome. 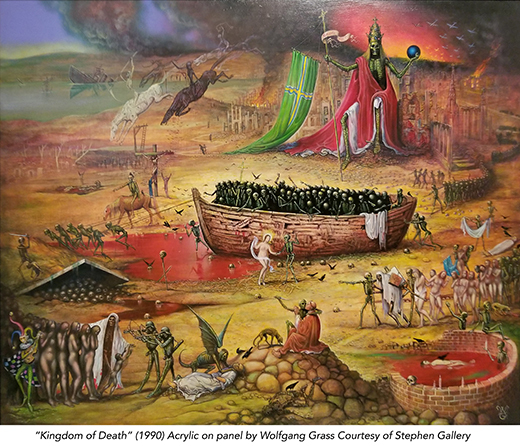 Among the most gruesome of these was the large acrylic-on-panel painting, “Kingdom of Death” (1990) by Wolfgang Grass, lent to the exhibit courtesy of the Stephen Gallery. 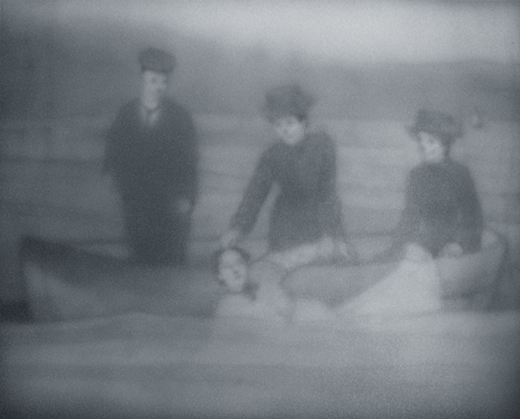 An ethereal, black & white, Spiritualist-inspired artwork, “The Styx” by Sherry Kerlin portrays ghastly yet serene figures in Victorian attire aiding the transport of a recently deceased over the river that leads to the world of the dead. The list of intriguing, emotionally moving and historically important pieces on display is too great to cover in this report. So too, is the broad and rare contribution which Morbid Anatomy has made and continues to make to our regional culture, exhibiting, educating and enthralling all who frequent this unique institution. Visit the morbidanatomy.blogspot.com to learn more, and by all means get over to the Morbid Anatomy Library in Brooklyn on Saturdays and Sundays to view the exhibition and to peruse the library. It is to be found at the gatehouse by the intersection of Fort Hamilton Parkway and Micieli Place. One of the most prominent tributaries of Goth culture flows from the cold, dark land sunless winters, particularly the Nordic traditional folk traditions from the Middle Ages. These are the original Goths, whose sombre folklore has shaped numerous forms of expression from Existentialism to Black Metal. Darby Lahger is an American-born transplant to Dalarna, up in the forests of northern of Sweden where, with her husband and three children, she lives a life heavily influenced by the history, legends and aesthetics of her adopted homeland. She is also noted photographer. 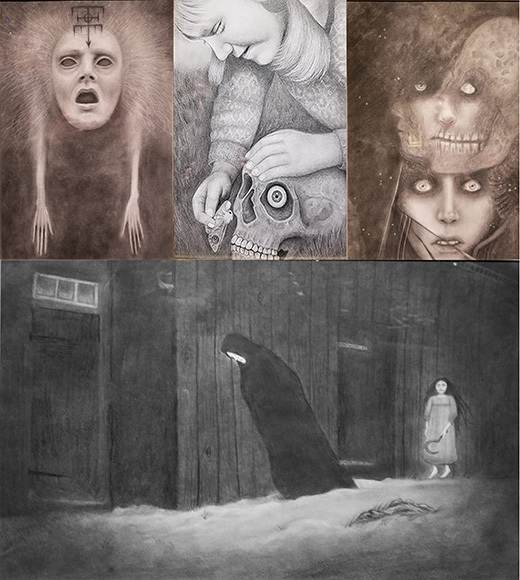 The Last Rites Gallery hosted Lahger’s first solo exhibition of 17 of her drawings in graphite and charcoal, depicting witches, giants, gnomes ghosts and the like, all culled from Scandinavian mythology. Some are portraits, other scenes and others still are surreal. All have a naive, art-brut style which is not to say that there isn’t some excellent draftmanship as well. 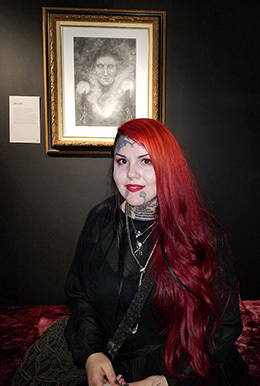 We spoke to Darby who was enthusiastic in reporting on the legends and superstitions that inspired her work – ghastly night stalkers, practitioners of black arts and characters from nightmarish folk tales. Currently she is illustrating a book of stories with related fables being written by her Swedish husband. The exhibition opened Oct 5 and runs until Oct 20, 2018. Raymond Watts of industrial rock band in collaboration with author/singer/adult film star Sasha Grey issued this EP on Metropolis Records on Aug 31. Built around a cover of the 1975 disco hit by KC and the Sunshine band, it also contains remixes of three tracks off the recent (June 2018) album “Risen.” Two versions of “That’s the Way (I Like It)” appear on this EP, constituting the first and third tracks. The first of these is dubbed the “rougher” version and the other called “PIG in the disco Remix.” The former is also available as a softcore video – believe it or not – on Pornhub! Musically, it is a down and dirty cover of the Sunshine Band’s original, complete with harsh percussion, growls and choral voices. Sasha Grey’s lead vocals have a sensuous, seductive quality, and are counter-posed to coarsely baritonal male replies. In second version (track number three) there is a weirdly ethereal intro with faraway vocals that rise gradually and distantly out of the wash of instrumental music. As this track progresses, it grows chaotic, yet retains a menacing, relentless cadence that suggests a plodding hoard of zombies on the march. Both tracks retain the familiar driving rhythm and backup vocals of the 1975 work but with sonic complexity galore. Track number two, “Truth Is Sin” represents a Chris Hall remix of the song of the same name off the “Risen” album. It is a mean-spirited, hissing revisit of the album original but with bursts of guitar and a generally faster pace, giving it the Stabbing Westward signature sound. 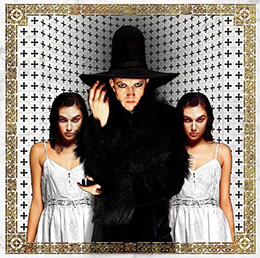 Track four, the Hanzel und Gretyl remix of “The Revelation” has the same feel of post-apocalyptic funk as the original, featuring gravelly, croaking vocals, and swirling, repetitive guitar mantras that are on the “Risen” version, with little discernible difference from the original. Finally, Ego Likeness has remixed “Cult of Chaos,” adding crackly deep male vocals, hand beaten percussion and tidal waves of pleasing, melodious, rhythmic sound. Like the antecedent album “Risen,” this EP offers mesmerizing grooves, irresistible rhythms and creative electronica in both the original Raymond Watts compositions and the cover versions of the familiar 70s megahit. Be sure to check out the PIG & Sasha Grey video of “That’s the Way (I Like It)” which you can find on Youtube without having to navigate through Pornhub. 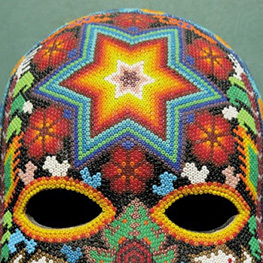 Neoclassical darkwave music project Dead Can Dance is about to release their ninth studio album called “Dionysus” after the Greek god of wine and religious ecstasy. Like much of their body of work, it will address its theme with folk instrumentation, field recordings and chants. The opus represents the myth of Dionysus in two acts of seven movements. The first movement of the second act, “The Mountain” has been made available to listeners on Pitchfork. The myth of Dionysus, his birth on Mt. Nysa, where he was brought up by the centaur Chiron and ultimately, the chants and dances of the Bacchic rites are represented in musical form in this work. Listeners can expect the same gorgeous, powerful-yet-ethereal melodies, operatic-quality vocals and mesmerizing rhythms for which DCD is famous. 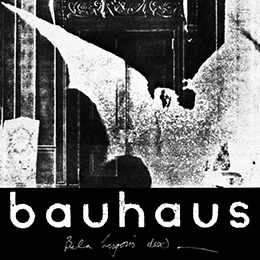 To celebrate Bauhaus’s 40th anniversary two companies, Leaving Records and Stone’s Throw Records are issuing an EP of largely unreleased tracks from the January 1979 session at which the defining anthem of Goth rock, “Bela Lugosi’s Dead,” was recorded. It opens with a nine and a half minute remaster of the work after which it is named. The second and third tracks are the never-previously-released “Some Faces” and “Bite My Hip” which was later re-recorded as “Lagartija Nick,” the latter of which was included in the Singles EP. The fourth track is “Harry,” the Ska/Reggae-flavored piece named for Blondie’s Debbie Harry. The fifth and last track is the original version of “Boys,” a very different version of which can be found in the Goth Box compilation. It’s rare for something as monumentally iconic to arise from the corridors of time as far back as 40 decades ago, and this EP is sure to be a collector’s item when it comes out. Right now they are taking pre-orders and offering free download of the title track. A red vinyl version will be available as will the entire Bauhaus catalogue later this year to commemorate the fortieth anniversary of the band. 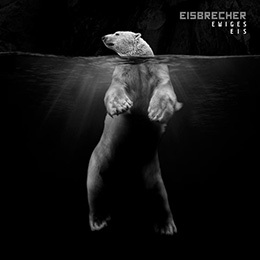 Industrial, dark-electro rock band Eisbrecher released a 2-CD collection “Ewige Eis” (“Eternal Ice”) subtitled “15 years of Eisbrecher” with 20 tracks on the first disc and 18 on the second. This “best-of” set captures the German powerhouse band’s repetitive guitar riffs, deep dark vocals, with a smattering of choir singing and heavily cadenced military-march-percussion. Gravel voice vocals are the rule but occasionally more melodious male singing alternates with ritualistic and female choral sounds. If you wish to sample the album, there are two tracks, namely “Verrückt” (“Crazy”) and “Was Ist Hier Los?” (“What’s Going on Here?”) that are both available as cinematic videos. The former mocks corporate board meetings. The latter displays disturbing, archival videos of examples of barbarity in war and everyday brutality that usually goes unseen. Both feature the driving beats, industrial guitars, chorals and danceable rhythms that are representative of the 2-disc Eisbrecher retrospective. All fans of radio and of Sci-Fi are aware of – and fascinated by – that wonderful historical event when eccentric media icon Orson Welles played a monumental prank on audiences when he broadcasted a show based on H.G. 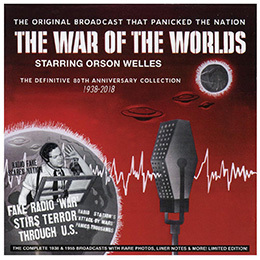 Wells’s “War of the Worlds.” He so structured the narrative as to leave it ambiguous to naive, radio-era listeners as to whether it was an actual news report or a mere tale of fiction. Mass panic ensued. It turned into one of the greatest spoofs of all time in 20th Century American culture. Now Cleopatra Records exec Athan Maroulis (Spahn Ranch, Black Tape for a Blue Girl, Noir) has gathered together a 2 CD collection that includes the complete original 1938 broadcast along with a 1940 conversation between Orson Welles and H.G. Wells and a rare 1955 broadcast. It became available Oct 19 on disc and on digital format in both the U.K. and the USA. A must-have for students of weird history, 20th Century madness, Depression-Era eccentricity, media, sci-fi and general shenanigans.